I think that the mint does a good job of toning down the coconut flavor in this ice cream. Since it’s made with coconut cream, you’d expect it to be overwhelming coconut-y, but it’s really not. We eat a lot of coconut, though, so if you’re extra-sensitive and don’t care for the flavor of coconut this is probably not the recipe for you. You can use either coconut cream or coconut milk in this recipe. Coconut cream will make your ice cream even creamier, so I often pick this option when I have a choice. Coconut milk works just as well, too, though. I prefer this brand of coconut cream and this brand of coconut milk. Both are free of preservatives and any added gums/starches, and they come in a carton rather than a can. In my experience, the BEST place to buy this coconut milk and coconut cream is at your local Asian market. If that’s not an option, though, you can buy coconut milk online here and coconut cream online here. I get this question from time to time. Honestly my first response is: get an ice cream maker! 🙂 Seriously. If you like coconut ice cream and think you’ll make it regularly, an ice cream maker is 100% a worthwhile investment. We got this model for our wedding in 2008, and it probably made a few hundred batches of ice cream before it finally gave out in 2016. Mix the coconut cream, honey, vanilla extract, peppermint extract and stevia by hand or in a blender. Pour into your ice cream maker and begin processing. When the ice cream begins to solidify but is clearly not yet finished mixing, add your chocolate chips or chopped chocolate to your ice cream maker. My ice cream maker takes about twenty minutes to reach the "solidifying but not yet finished" stage, but I know that newer Cuisinart models make ice cream faster, so your time may vary. Just check on the ice cream frequently to make sure that you don't add your chocolate too late, as if the ice cream becomes too solid it won't be able to adequately mix in the chocolate. Continue to process ice cream until it reaches your desired firmness. Serve immediately or put in the freezer for a few hours to make it firmer. Store leftover ice cream in the freezer, preferably in a wide, shallow container to simplify future defrosting. By the next day, your stored ice cream will have become very hard in the freezer. Just be sure to plan ahead when you want to eat it—it will probably need twenty or more minutes of defrosting on the counter before it can be served and eaten. 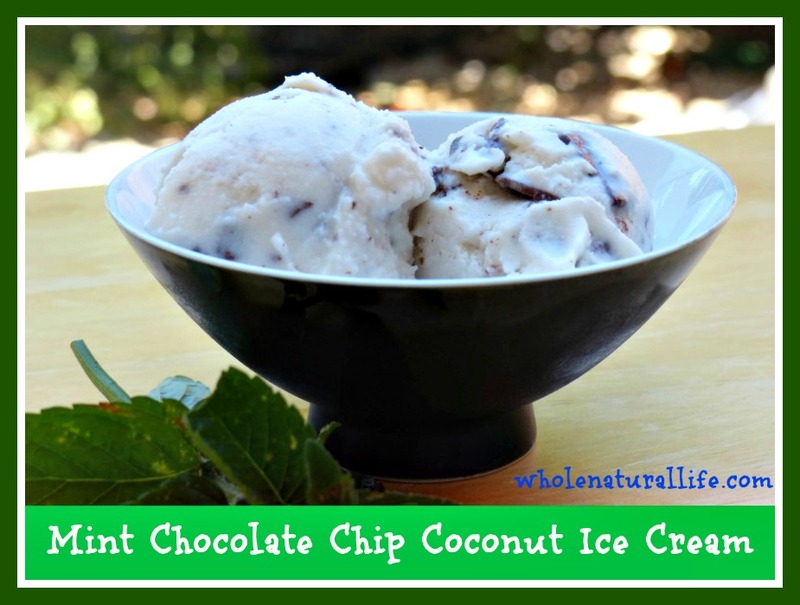 Looking for more coconut ice cream recipes? If you’re also a fan of cashew ice cream, go try my recipes for cinnamon cashew ice cream and chocolate cashew ice cream. This looks delicious! I love mint chocolate chip ice cream. I love coconut ice cream and this looks tasty. Like the idea of using coconut cream too. Thank you for sharing on Natural Living Monday. DawnMarie, I usually buy Aroy-D coconut cream in tetra-paks. I get it at a local Asian market. Here it's about $3.50 for about four cups--but I'm sure that price varies depending on where you buy it. I'd suggest checking out local Asian markets to see if you can find it or something similar. You had me at mint, chocolate, chip, coconut and ice cream. Looks yum!